In Republic of Islamophobia: The Rise of Respectable Racism in France, Jim Wolfreys describes the emergence of a ‘respectable racism’ against Muslims in France since the 1980s, fuelled by the ‘War on Terror’ and rooted in the nation’s colonial history. Praising the book’s candid and incisive writing, Elsa Stéphan welcomes this as a commendably comprehensive and accessible account on Islamophobia in contemporary France. I can understand the exasperation of some of our compatriots when there are some neighbourhoods where a mother or father will come home from work in the evening to learn their son has had his pain au chocolat snatched out of his hand by thugs, telling him it is forbidden to eat during Ramadan (Jean-Francois Copé reported in France 24, 2012). A few decades ago, such a lurid invention targeting Muslims might have emerged from nationalist parties, but this very sentence was pronounced in 2012 by a centre-right French member of parliament, Jean-François Copé, revealing the normalisation and embrace of a racist discourse by mainstream parties in France. 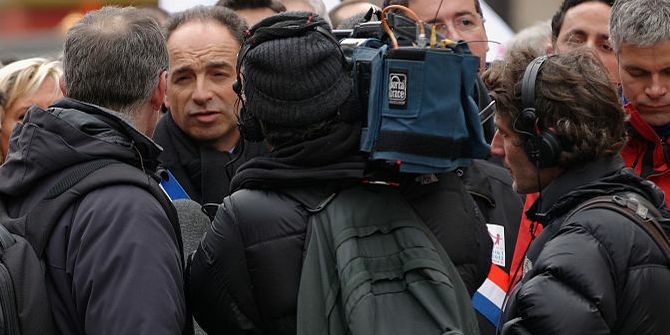 A few weeks later, Copé was elected president of the main French conservative party. This anecdote illustrates what Jim Wolfreys, in his new book Republic of Islamophobia, describes as the rise of a ‘respectable racism’ against Muslims in France since the 1980s: a poisonous narrative engrained in ‘a war on Terror’ with paternalistic and colonial overtones. Far from confining his analysis solely to contemporary France, Wolfreys goes back into history to denounce what he views as a form of neo-colonialism deeply entrenched in a French past, affecting many communities as a result. As a further example, a few months after his 2007 election, former president Nicolas Sarkozy gave a speech in Dakar, Senegal, in front of scholars and journalists in which he described at length what he perceived to be Africa’s problems: ‘The tragedy of Africa is that the African has not fully entered into history.’ His advice that was ‘the African’ should start growing their own food to avoid starvation. With his speech, Sarkozy brought his audience back to the mindset of nineteenth-century colonialism. In France, Islam in particular has been portrayed as breeding riots and terrorism and as subjugating women. Yet, as the author reminds us, the majority of third-generation French citizens of North African descent do not have any religion. It is generally assumed that France’s ‘Muslim population’ equates precisely to the number of people of North African background living in France, no matter what their relationship to religion might actually be. Islam has thus become an imagined threat in France over the last thirty years. There is a disturbing discrepancy between the way French Muslims are perceived and the reality of their religious practices. This misrepresentation of Islam, coupled with mainstream racism, certainly goes far beyond French borders. As Wolfreys observes, a few months after US President Donald Trump’s Muslim ban and the Austrian far-right’s electoral triumph, we can unfortunately consider Islamophobia to be a global phenomenon. Nowhere, however, have efforts to unite Islamophobes behind the state’s authority been as successful as in France. Wolfreys brilliantly unpacks the political, cultural and economic mechanisms that have rendered French Muslims the ideal scapegoats of an entire nation. Wolfreys’s position as a British political scientist perhaps gives him a perspective that few French scholars and journalists have been able to offer, as most French citizens are firm believers in secularism – or laïcité – as an unquestionable value: a national myth that one could ironically compare to a state religion, used to justify a state racism. Although scholars including Thomas Deltombe have studied a particular aspect of Islamophobia, such as its representation in the media, they have not provided the take on laïcité and French culture that Wolfreys presents in this book. Put bluntly, France’s problem is not laïcité but racism. Laïcité has simply become the most respectable and therefore effective means for it to be expressed today. Wolfreys also analyses the role played by political actors, supported by ‘neo-reactionary’ intellectuals and the quasi-permanent platform they have been given by the increasingly sensationalist media. Despite the serious analysis Wolfreys makes of an alarming global wave of racism, his humour and derision when describing the actors who have contributed to its rise in France renders his essay viciously delightful at times. By making a mockery of Sarkozy’s ‘vulgar chauvinism’, ‘veteran media darling Alain Finkielkraut’ and ‘well-to-do billionaire feminist Elisabeth Badinter’, Wolfreys denounces all the protagonists responsible for recasting racist attitudes into a republican framework, from public intellectuals to journalists and politicians of all parties, while only devoting a few pages to Marine Le Pen, too often considered as the sole incarnation of French racism. Indeed, for Wolfreys, the rise of racism in contemporary France has little to do with her party, the Front National. Instead, he argues that one of the reasons France has been particularly affected by Islamophobia is due to its economic situation and growing inequalities. In Chapter Four, Wolfreys refers to Thomas Piketty’s Capital in the 21st Century (2013) to compare inequalities in contemporary France to novelist and playwright Honoré de Balzac’s vision of nineteenth-century France. Inequalities are indeed greater now than they were in this era. Not only is unemployment high, but jobless individuals in France go through one of the longest periods of unemployment in any developed nation. In 2006, 48 per cent of the population thought that they could one day become homeless. In 2008, that percentage had reached 60 per cent. To Wolfreys, Islamophobia and the popularity of the Front National is furthermore fuelled by a deep crisis of political representation, as centre-right and centre-left parties try to support a faltering neoliberal project, while blaming Muslims for the lack of jobs resulting, in part, from their own political decisions. Wolfreys’s book has the merit of providing not only a retrospective and external perspective on a particular situation in France today, but it also forces us to look at a range of global phenomena: the consequences of neoliberalism, the role of growing inequalities since the financial crash of 2008, the crisis of political representation in mainstream parties and the rise of Islamophobia. These are worldwide threats that need to be not only analysed but also linked in order to face the crisis encountered by many Western democracies. While other books have tackled these issues, the present book is by far the most comprehensive work on Islamophobia in contemporary France. Wolfreys’s direct style and caustic humour make his work accessible to a wide variety of audiences, including students and scholars in French studies, political science and religion. Elsa Stéphan is a lecturer in the Department of French and Romance Philology at Columbia University, New York. She studied journalism at the Sorbonne before completing a dissertation in the United States on technological utopias in nineteenth- and twentieth-century French literature. Her current research focuses on media studies.